Stockshop Poultry Leg Protector should be sprayed liberally from the thigh and along the shank down to the toe, including the ball of the foot. It's performance is enhanced if the bird is bathed in warm water for a few minutes to allow the scale on the legs to soften. The natural enzyme solution will penetrate where applied and will work to ensure that the legs are clean. Stockshop Poultry Leg Protector contains safe, natural enzymes that are non-toxic, biodegradable and environmentally safe. 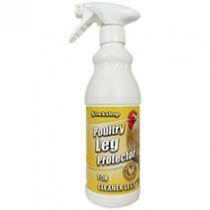 If your bird is suffering from poultry leg Issues, remove the bird from flock and place in quarantine until clean.